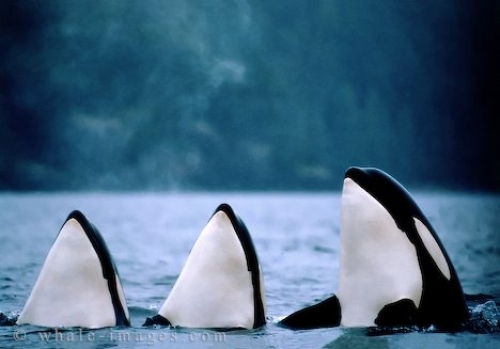 A unique picture of three spyhopping orca whales checking out the sights above the water and enjoying the ocean life ! Spyhopping is when the Killer whales hang vertically in the water with their head partially above the water line. It is unusual to have three orca whales spyhopping right next to each other and at the same time. These guys were definitely synchronized as they rose to the top and then just as gracefully slid back down to below the water line, back into their ocean life. Looking for more ocean pictures? Here you can find a great selection of great ocean pictures and many other pictures.